If you're 41 weeks pregnant and baby still hasn't arrived yet, find out why — and discover options for speeding up labor and delivery. By the time she's born, your baby may be watermelon-size. You're expecting to give birth this week, but don't worry if your baby decides to stick around a little longer. Many first babies are late, and she'll be worth the wait — we promise! As amazing as it is to meet your baby for the first time, don't be alarmed if she's not exactly, um, as good-looking as you imagined she would be. Those delivered vaginally tend to have temporarily misshapen heads and puffy eyes. And your baby will probably be coated with vernix caseosa, but most of it will be washed off during the first bath. It takes most newborns a few weeks to get that adorable, chubby-cheeked baby look down pat. During this week's visit, your healthcare provider may want to get an idea of your baby's weight. One of the most important measurements the sonographer can take is the abdominal circumference. 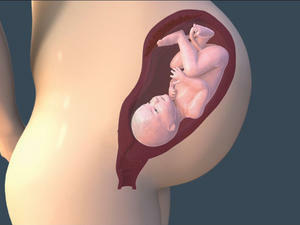 This image is a cross section of your baby's belly. Once your provider has an idea on weight, they may suggest options to induce labor. Still pregnant? That's okay. Babies come to term anywhere between 38 and 42 weeks. Your 40-week due date simply marks the midpoint of this period. If your delivery is scheduled, you'll check into the hospital and either be prepped for a C-section or, if you're going to deliver vaginally, given something to induce labor, like a prostaglandin gel to soften or ripen your cervix or an IV drip of pitocin (a synthetic version of the hormone oxytocin) to start up contractions. If you go into labor on your own (your water has broken or you're having contractions that are growing steadily more painful), call your doctor or midwife for instructions. When you think about what labor and delivery might be like, odds are you're not exactly fantasizing about having a C-section. (It is major surgery, after all.) You may feel upset or disappointed if your doctor recommends one -- or seriously freaked if you're suddenly whisked into the operating room after hours of labor. While it's completely normal and valid to have these feelings, remember that what matters most isn't how you deliver your baby, but that he arrives healthy. It might help to discuss all those burning what-ifs with your doctor now, so you're at least somewhat prepared and know at what point or under what circumstances she'd consider performing one. The more informed you are, the easier your mind will rest.